Mastercard dropped their Earthport bid last week and plans to purchase Transfast instead. This instantly reduced the value of Earthport shares. Visa will now close the deal at 37p/share, 26% below the peak price in their recent bidding war but 30% higher than Visa’s initial bid. So who wins from all this? Definitely Transfast (who we spoke to this week). Earthport shareholders – but not as much as they’d hoped. MasterCard already works with Transfast, providing payout services, which likely gave it an edge. Whilst both Earthport and Transfast offer access to a global banking network, Transfast has a strong focus on emerging markets. Both Earthport and Transfast have been offering access to their network to third parties. Will Visa and Mastercard choose to now restrict access and use this as a competitive advantage? Can we forecast the direction of Mastercard Send given the emerging market strength of Transfast? 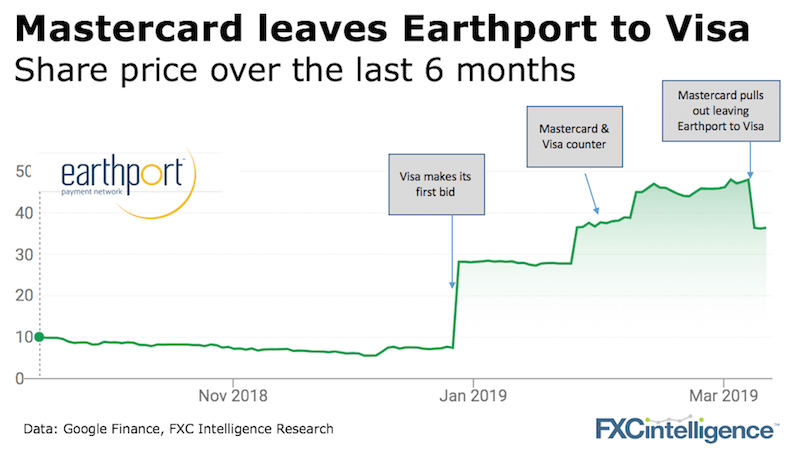 Visa stated in its offer document it was looking to Earthport to develop its marketplace capability, something Mastercard picks up already with Transfast. Is this a signal of a new marketplaces focus for both Mastercard and Visa? If it wants to gain a true competitive advantage over Visa, why didn’t Mastercard buy both Earthport and Transfast? You should read the mainstream press – they do a great job amplifying what everyone does in the sector. Just make sure you read us too.